London Times correspondent J.B. Kendall is disappointed when he misses a chance to ride with Custer and the 7th Calvary to what is sure to be a big victory against Sitting Bull at Little Big Horn. But he at least gets a chance to ride along with a smaller patrol. But when the overconfident officer leading the patrol rides into an ambush, Kendall finds himself trapped along with two others in an isolated cabin. It's the sort of "last stand" situation that's been done a gazilion times, but can always make for good storytelling if the plot is well-structured and the characters are interesting. The story contains a remarkable level of tension and inherent tragedy. One of those trapped with Kendall is a woman who's son had just burned to death in a neighboring cabin, but she manages to pull herself together and remain useful. Played with a combination of quiet strength and restrained grief by Jeanette Nolan, she is a truly great character. The third person in the cabin is a Crow army scout named Six-Toes. A scene in which Kendall and Six-Toes sneak out of the cabin to try to get a drop on the hostile Cheyenne builds into a violent and effective climax. From start to finish, this is a superb example of one of radio's better Westerns. 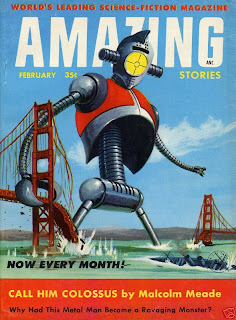 It's always fun to stumble across a pulp-era story I haven't read before. 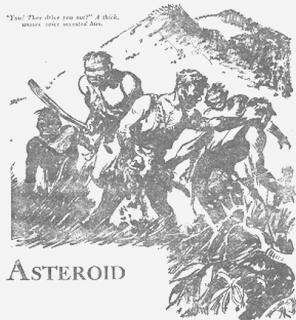 "The Devil's Asteroid," by Manly Wade Wellman, was published in the July 1941 issue of Comet magazine. It's not a classic, but its a fast-moving and entertaining short story with a cool setting. The main character is Fitzhugh Parr, an Earthman who's been accused of murdering a Martian. (He claims self-defense, but he seems to hate Martians so much, I'm not sure he can be considered a reliable narrator.) Because Mars and Earth have a treaty that prevent them from executing each others citizens, Parr is sentenced to permanent exile on an asteroid. It's a tiny world where an artificial gravity generator is used to maintain an atmosphere, along with enough plant life to provide food. Parr is left there and soon contacts other exiles. He's surprised to find that, as the newest guy, he's now in charge. There's a reason for that odd custom, though. On this planet, humans gradually regress, becoming more and more animal-like until they eventually become animals. The regression is physical as well as intellectual, so there's a community of ape men who have been exiled from the other exiles. Parr is a two-fisted sort of guy, so he immediately comes up with a plan to capture the next Martian ship that lands, eager to get away before he begins regressing. This doesn't go well and he ends up losing his leadership position to a newly arrived woman. 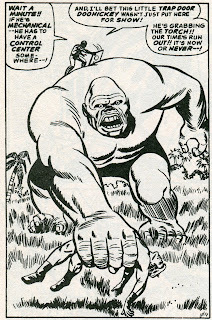 But, through the time-tested method of beating up a really big ape man, he soon gain controls of the ape man community. But there is more going on around the small asteroid than Parr suspects, all leading up to a fairly nice twist at the end. Not a bad little story at all. It's available to read online HERE. There is one interesting thing to note about this story. The Martians in it pretty much come across as a sadistic race, using this particular asteroid as a sort of Botany Bay simply because the regression is a way to torment the exiles. I guess it's because Mars is named after the god of war, but it's turned out to be populated by a pretty high percentage of violent races in various fictional universes. There's been some benevolent and/or peaceful Martians from time to time, but most of the best-known Martians would just as soon cut your throat as look at you. In the case of H.G. 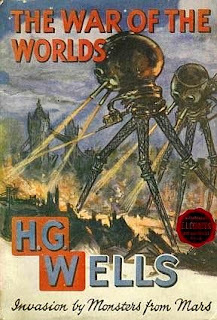 Wells' Martians , they'd drink your blood afterwards. Edgar Rice Burroughs gave us a Mars where there's nothing anyone likes better than a good sword fight. 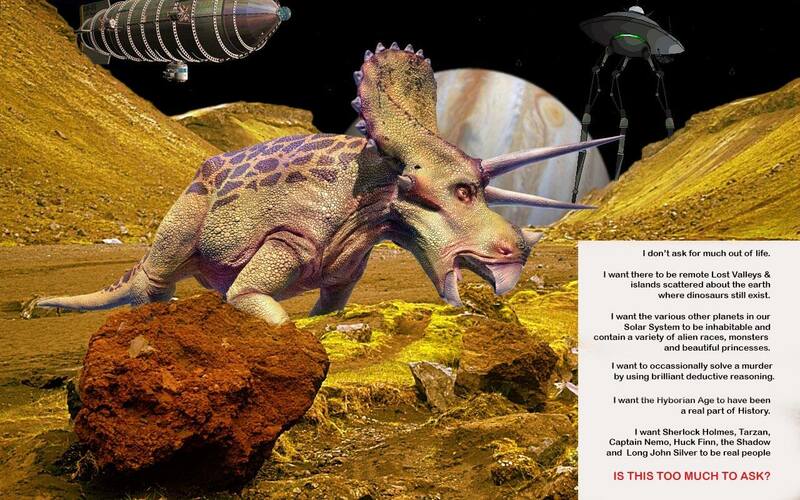 Robert Sawyer's time travel novel End of an Era gave us an intelligent Martian virus that took control of dinosaurs. Heck, even the Topps trading cards company gave us Martians mean enough to shoot a dog. There's no getting around it. If you ever meet a Martian, run for it. There's just no trusting 'em. Poor Alicia Masters. Her studio apartment gets trashed yet again; this time because a component for a villain’s super-weapon was accidentally delivered to her. That’s just one of several extreme coincidences that drive this story along, but there the sort of coincidences that are common in a comic book universe and---if the story is entertaining—they are coincidences we are willing to accept. 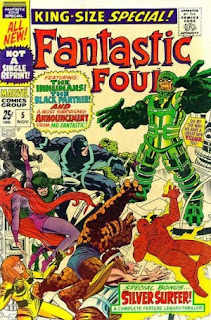 And it’s lucky this story is entertaining, because not only does the FF become involved due to a henchman mis-reading an address label, but the villain’s secret headquarters just happens to be on a Caribbean island owned by the Black Panther. An island that the Inhumans just happen to be stopping at. Anyway, the villain is Psycho-Man. He’s not a top tier bad guy at all, but he is one of the many Marvel supercrooks who are quite capable of carrying an occasional story. His visual design is striking and his origin is pretty unique. He comes from a sub-atomic world that has an over-population problem, so he’s decided to conquer Earth to get room to expand. The being we see in the story is actually a robot body housing a microscopic being. That’s a cool concept, of course. Though, when you think about it, the whole invasion plan seems unnecessary. Since Psycho-Man’s world is sub-atomic, couldn’t they all just move into a Petri dish in Reed’s lab and have enough room for generations of expansion? Anyway, Psycho-Man has a mind-ray that can induce crippling fear, doubt or hate. He also has three henchmen of the sort that Jack Kirby was so good at creating: Live Wire is a cowboy with an electric gun and lariat. Shellshock’s gun fires small guided rockets, while the Slavic-looking Ivan has a solar gun that fires blinding light. In other words, they are that unique brand of individualized secondary characters that Jack could probably create in his sleep. 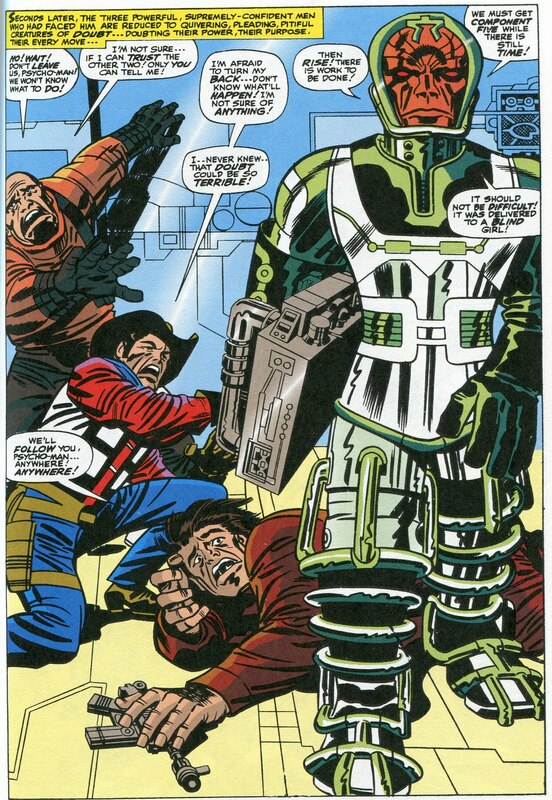 So, Ben, Johnny, the Inhumans and Black Panther all end up fighting these henchmen, then go up against illusions representing their greatest fears. 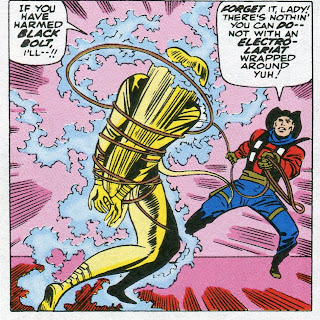 But Gorgon’s shockwaves are able to dissipate the illusions and Psycho-Man is defeated. But wait! Why weren’t Sue and Reed there? Because Sue’s gonna have a baby!!! She’s begun what—in real life time—will be the longest pregnancy ever. So Sue doesn’t come along because she can’t put her baby at risk. That’s understandable. Reed doesn’t come along because… um, because… well, apparently Reed is now completely whipped. All making fun aside, this is a good, solid story with a nifty blend of different heroes, existing mostly to let Jack Kirby show off his visual awesomeness. 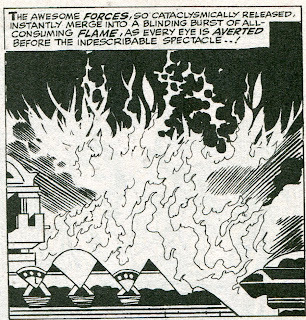 But the little character bits that define the Fantastic Four are still very much present. 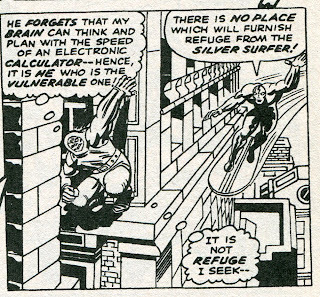 The Surfer runs across Quasimodo, the living computer used by the Mad Thinker in the previous annual. 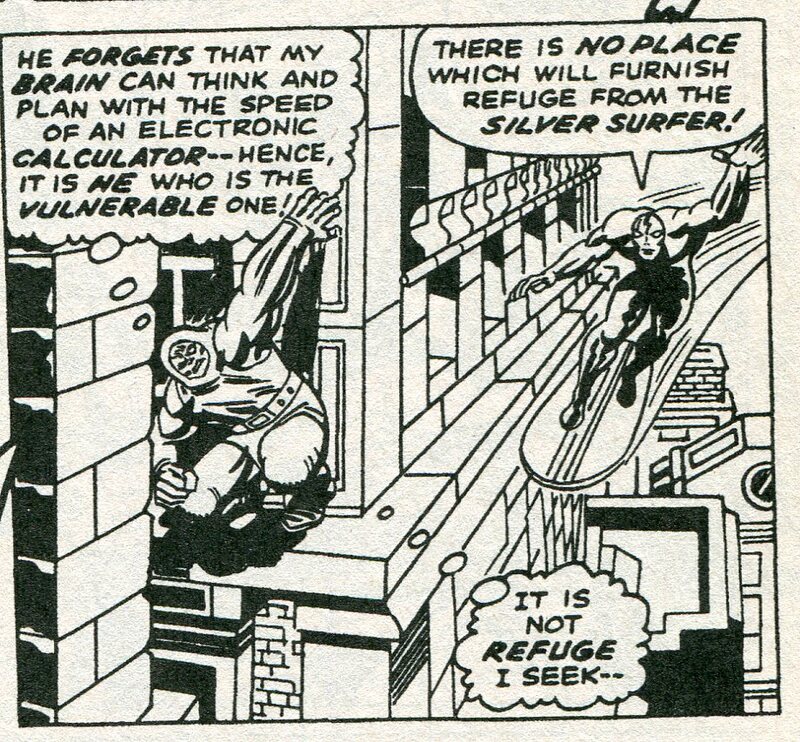 In an act of pity, the Surfer creates a body for the lonely computer. But that doesn’t work out well. Quasimodo, after all, is short for Quasi-Motivational Destruct Organ, which basically means he starts to wreck stuff. After a brief struggle, the Surfer converts Quasimodo into a statue. Well, I’m sorry, Surfer, old man. First, you can eat a duck. 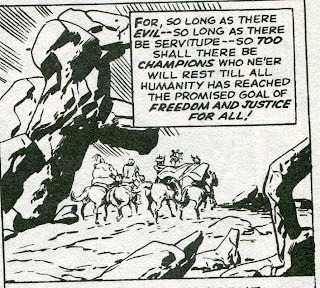 Second, you live in a universe populated by the Skrull and the Kree and the Toad People and the Brood (well, I grant we haven’t met the Brood at this point) and gosh-darned Rock Men from Saturn, all of whom regularly act in bloodthirsty and aggressive ways. Humans actually look pretty good in comparison to those guys. The Surfer’s a great character and an important addition to the Marvel Universe. And, as I said, using him as a outside observer of mankind is a great idea. But that aspect of his character was sometimes overwritten. Just give the poor duck hunters a break and move on. 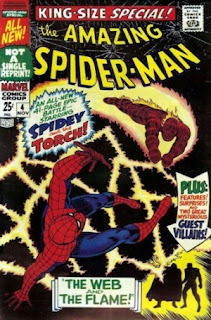 This annual gives us an always-welcome Spidey/Torch team-up. And they face a villain team-up: The Wizard and Mysterio have joined forces to destroy their respective arch-enemies. 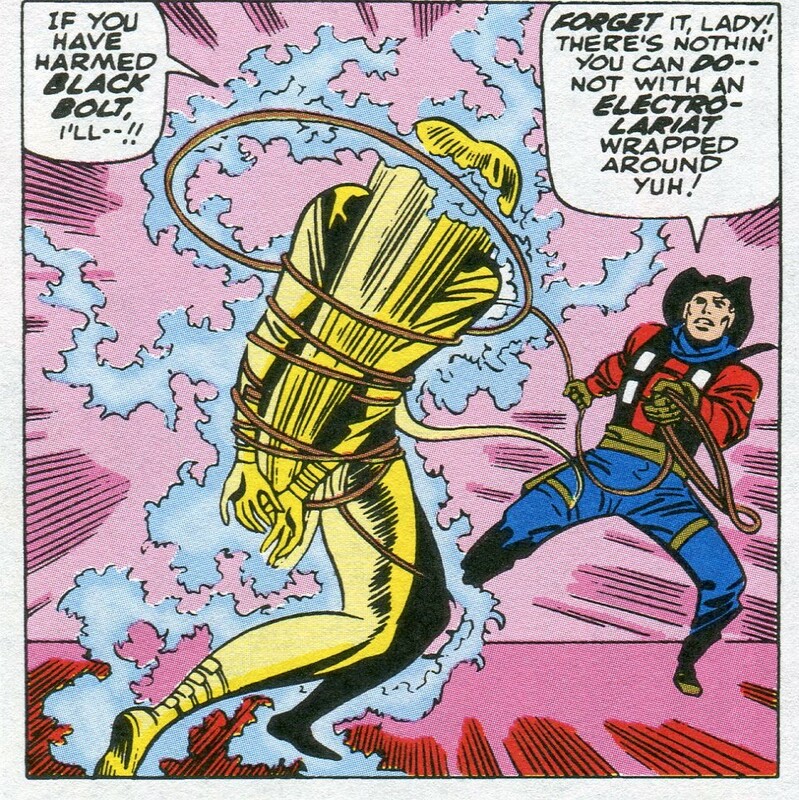 It’s actually a trap that Johnny should have seen coming, since Namor once did the exact same thing to lure the Fantastic Four into danger. The villains form a movie studio and cast both the Torch and Spidey as stars of a film, positioning the heroes so that they can drop the hammer on them. I guess I’m in a nitpicky mood this week, because I have yet another nitpick. The Torch, of course, has no secret identity, so paying him for a film role is no problem. 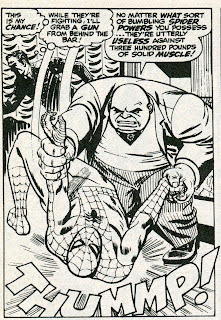 But Spidey was briefly in show business at the beginning of his career, but his manager was never able to pay him because SPIDER MAN CAN’T CASH A CHECK!!! That issue simply isn’t raised here. In fact, in years to come, it’s a problem that only comes up when the plot demands it. There are times when Peter earns money as Spider Man without any apparent tax or legal difficulties at all. Then there are times when Peter gets dumped on for exactly these reasons. It all seems to depend on the writer. 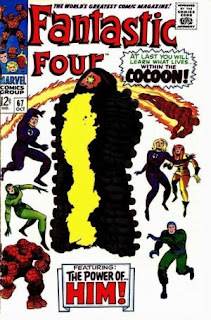 But if that had been the worst inconsistency the Marvel Universe ever suffered, it wouldn’t be in the mess it is today. The story itself is a great one. The various traps and threats used by the villains are pretty cool and the banter between Spidey and the Torch is as fun as ever. And Stan Lee doesn’t forget that Peter is good at science stuff, using this to allow him to outsmart the bad guys in the end. That’s it for the annuals. 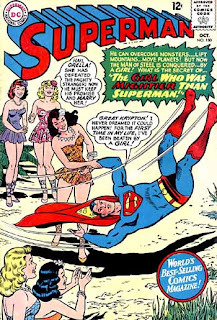 Next week, we'll join Superman and a bunch of stretchy guys for an unusal adventure. 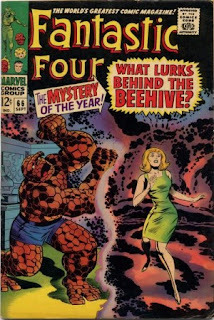 In two weeks, we’ll look at Marvel Comics regular issues for November 1967, in which Ben Grimm falls into a trap; Aunt May shows poor judgment when taking in a border; and Thor commits a felony or two. A woman with magical powers is hired by a movie studio to raise Shakespeare from the dead. But the Bard of Avon turns out to dislike working as a studio writer. Vincent Price sounds like he's having a ball playing Shakespeare. The story is mostly a parody on making movies that would appeal to the general public. There's any number of great lines ("What"s wrong with Abbot and Costello?" asks Shakespeare at one point. "I would have loved having them at the Globe.") and the supporting cast is top notch. "I can stand there amongst them in the day and night and laugh at them. " I do this blog for several reasons. Obviously, it's in large part for self-promotion--done with the hopes that some of you will click on the links for my books and buy them. Or request your local library get copies. Second, I feel it my duty to share my brilliant observations about all things geeky and thus bring an occasional glimmer of light to all your sad and dreary lives. But yet another reason is that it serves as a reminder to me of books, stories or films I haven't revisited in years. 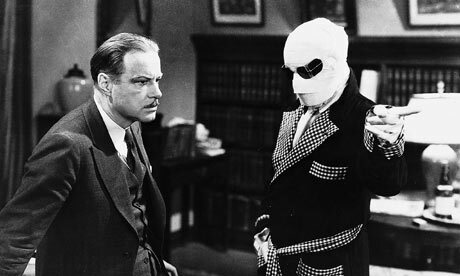 For instance, I haven't seen the classic version of The Invisible Man in a long, long time. So opting to discuss the films in that series gave me reason to watch it again. And, gee whiz, it's a great movie. John P. Fulton is responsible for the often remarkable special effects. James Whale does a great job as directer, injecting the film with his usual sardonic and sometimes campy humor. This is really apparent early on, as reflected in the wonderfully colorful characters that the Invisible Man encounters in a village pub. But the movie really belongs to Claude Rains. This was his American film debut and (despite never seeing him other than when swathed in bandages) he dominates every scene he's in. The plot of the movie has him going mad--a side effect of the drug that makes him invisible--and launching a reign of terror across England. He drafts his former lab assistant--a sniveling coward named Kemp--to help him deal with several drawbacks of being invisible. But Kemp betrays him and the police begin coming up with some reasonably effective tactics to stop him. The plot is very well constructed--with most events building out of the logical consequences of someone becoming invisible. Still, it's Claude Rains' vocal performance that makes this a classic. His insane rants are intermingled with occasional attempts at trying to remain calm--giving the whole performance a feeling of pathos. My favorite scene might be when he confronts his lady love and struggles to regain his sanity, only to tumble over the edge into Crazy Town once more. With the important exception of Casablanca, I'd rate this as Rains' best movie performance. The film is reasonably faithful to H.G. Wells' original novel, though it ramps up the title character's insanity and leaves out the social and political themes that Wells included in most of his novels. This was why Wells himself disliked the film, but I think he was wrong in this. Taken for what it is, it's one of the horror movie high points of all time. Poor H.G. He was a brilliant man, but his science fiction ideas were so inherently awesome by themselves that no one ever noticed (or simply didn't care about) any larger socio-political themes he might have been trying to discuss. The coolness of invisible men, time machines, and Martian fighting tripods simply overwhelmed any deeper points. The Invisible Man had several sequels made during the 1940s: The Invisible Man Returns (1940), Invisible Agent (1942) and The Invisible Man's Revenge (1944). We'll be getting to all these films eventually. (We'll be leaving out 1940's The Invisible Woman because it's not a part of the same continuity.) Though none of these are the classic that the original clearly is, all are worthwhile and enjoyable B-Movies. All are worth a look. Well, I was a little unfair in my criticism of this story line in my critique of the last issue. I was making fun of the fact that the enclave of scientists were being presented as good guys despite the fact that they’re plan to create a superior race to replace humans had some rather serious moral flaws in it. It’s been a few years since I’ve read this particular issues and it is one of the weaker Lee/Kirby arcs, so I had forgotten about the events of this issue. We learn here that the scientists, though some of them originally had a noble purpose, were pretty much planning on using their creation to rule the world. Still, the story arc as a whole comes across as a little contrived. It’s good for what it is, with events this issue concentrating on Reed’s genius and how much hard work goes into inventing cool stuff. He manages to duplicate the matter transporter and he, Johnny and Ben blip off after Alicia. Why doesn’t Sue come along? Because Reed refuses to place her in danger, telling her “NOT NOW!! !” That, by the way, is a foreshadow of things to come—that we’ll be hearing the patter of little feet scampering around the Baxter Building before long. Next month’s annual will be confirming this. Anyway, the super-powerful creature that the scientists invented can’t be controlled. Alicia never does get a chance to sculpt anything. 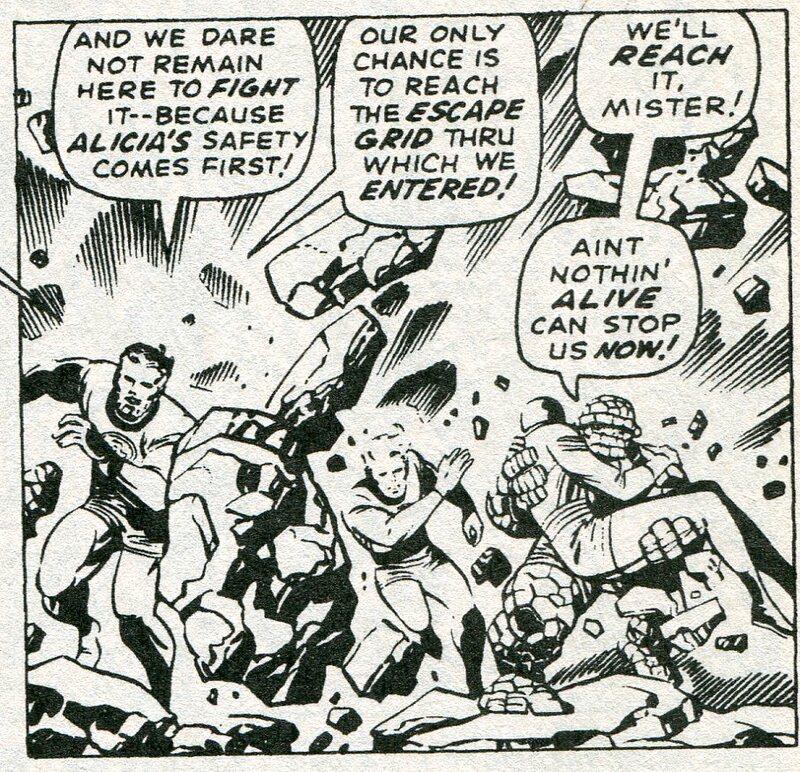 The FF minus one shows up to rescue her and super-powerful guy destroys the enclave, then disappears from continuity for a time. He pops up again eventually, but I’ll be darned if I can remember when and where. The Fantastic Four suffers from the same curse that occasionally hits Thor and Spider Man. Most of the time, the stories are so good, that the average ones really stand out as being merely… well, average. 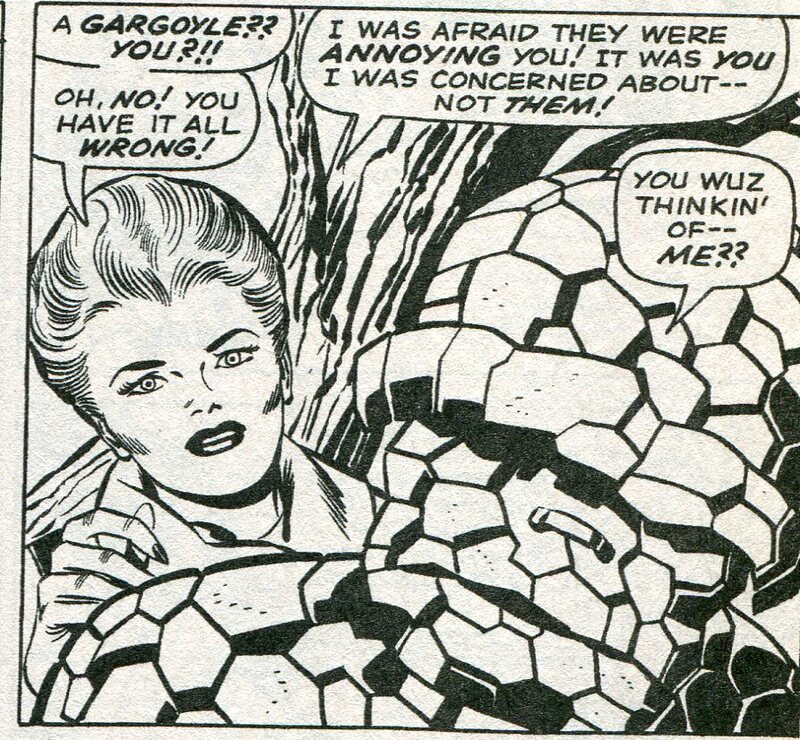 But even when the plot isn’t as cool as it could be, characterizations remain consistent and Jack Kirby’s layouts remain incredible. Peter and Gwen are taken to a science exposition by their professor (Professor Warren—who will have a rather interesting story arc of his own in years to come.) There’s a top secret anti-missile device being demonstrated for the public. Actually, demonstrating a valuable and TOP SECRET device for the public seems a tad silly, doesn’t it? Oh, well, it sets the stage for some great action scenes, so we’ll be forgiving. 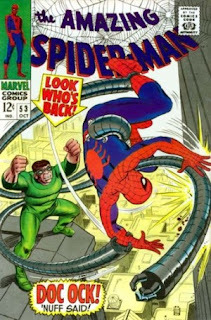 Doctor Octopus is at the exposition and tries to steal it—selling the device to a foreign power will fund his plans to build a criminal empire. As all good superheroes do, Peter immediately changes clothes and we get a well-crafted action scene with an interesting resolution. 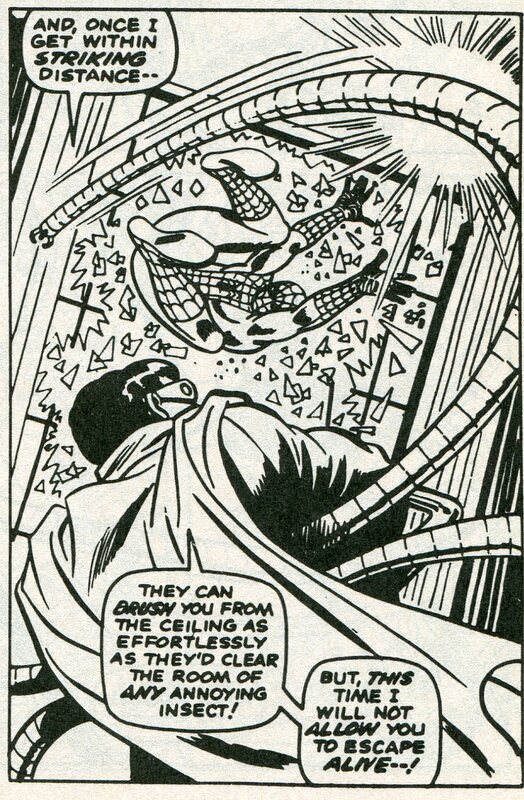 Doc Ock is blinded by Spidey’s web fluid, but manages to buy time to stumble away by dropping the missile device over some innocent bystanders. 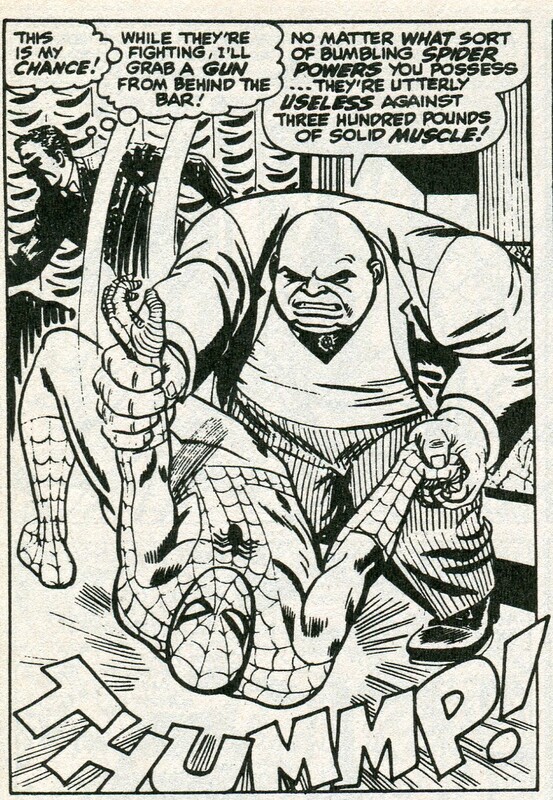 By the time Spider Man saves the civilians, Ock has made a getaway. Peter placed a Spider Tracer on the villain during their melee, but Ock finds it and uses it to set a trap. Spidey avoids this via his spider sense, ending this issue pretty much in a draw. Ock’s gotten away, but needs a new place to stay (having blown up his hideout in an attempt to kill Spider Man). Meanwhile, Aunt May has decided to take in a border. Gee whiz, she has a free room while Spider Man’s arch enemy is looking for a place to stay? That couldn’t possibly lead to trouble, could it? Odin wins his duel with the remaining enchanter, but the fight has apparently left him really, really grouchy. He summons Sif and Balder back to Asgard. They go willingly, but Thor still wants to hang out on Earth. 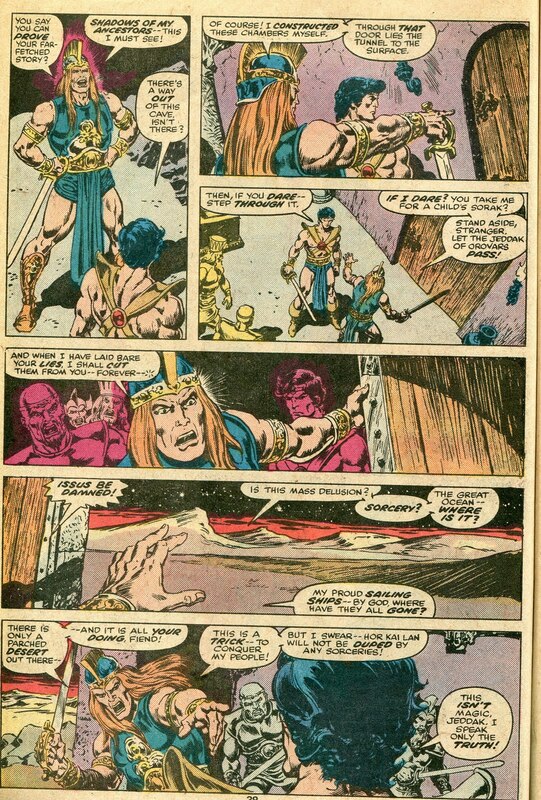 Odin grants this, but strips Thor of all his power except his super strength. 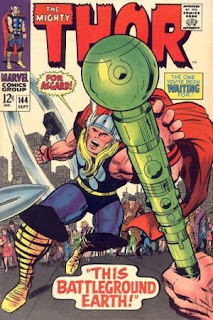 No longer able to change into Donald Blake (his hammer is still a handy weapon, but has none of its usual powers now), Thor scrounges up some civilian clothes and promptly manages to stumble across the Circus of Crime. Well, the Circus of Crime is planning… well… a crime. 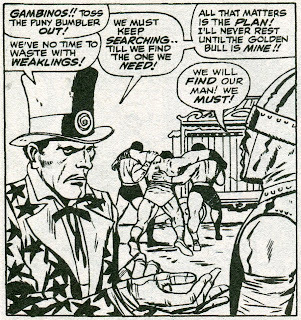 They need a strong man to “lift the golden bull” (we’re not told anything else about the job yet), but their own strong man strained himself trying to lift an elephant. 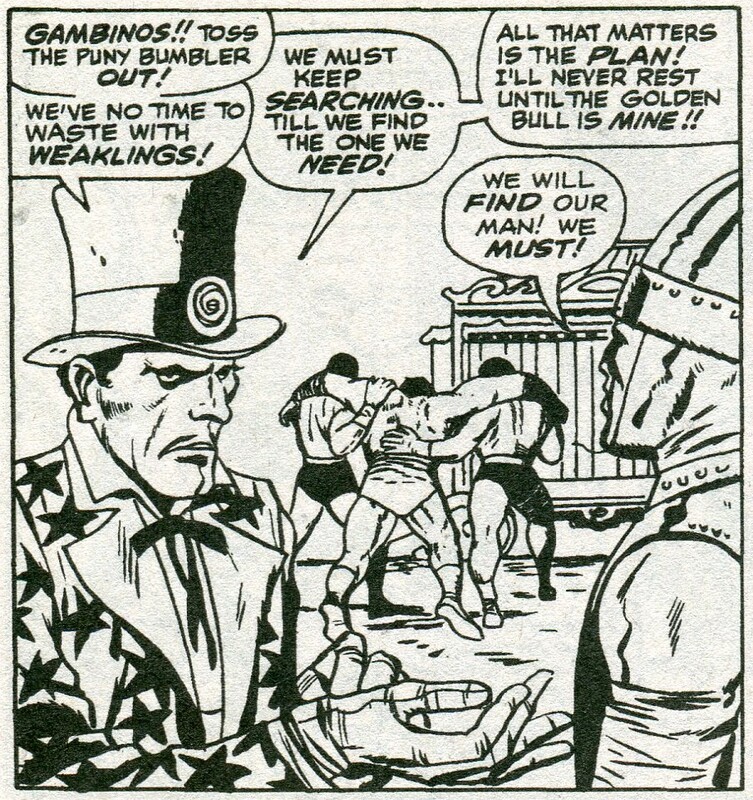 When Thor demonstrates his own strength, the Ringmaster hypnotizes him. So Thor has joined the circus. 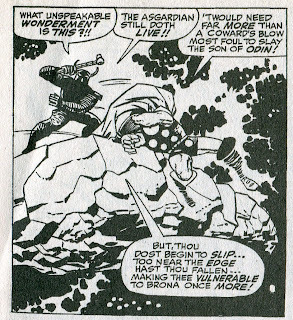 Now, I know I’ve been whining about recent issues of Thor not being cosmic enough. And a de-powered thunder god joining an evil circus really isn’t cosmic at all. But all the same, this is such a fun idea for a story, that I’m okay with it. 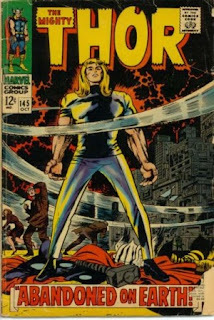 Besides, in a few issues, Thor will be going up against Loki, then the Wrecker, then the Destroyer—and, before too many issues go by, a bad guy with the power of a billion billion people. We’ve got plenty of “cosmic” coming up. This issue brings us the last of the “Tales of Asgard,” which manages to finish off Mogul with a destructive magical bolt before he can release a deadly plague. It’s actually all a bit too low key to be a truly satisfying ending to the series, not quite equaling last issue’s pure awesomeness. But it’s still a nice send-off. The next issue begins a back-up feature about the Inhumans, but this simply highlights why I no longer do every single Marvel Comic. 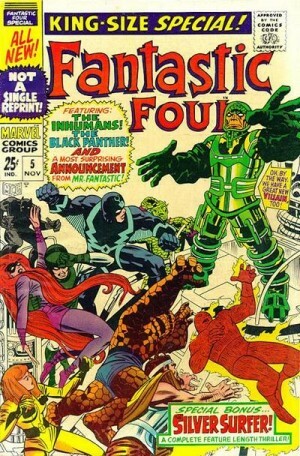 I don’t own reprints of the Inhumans feature, so I’m afraid we won’t be covering it. 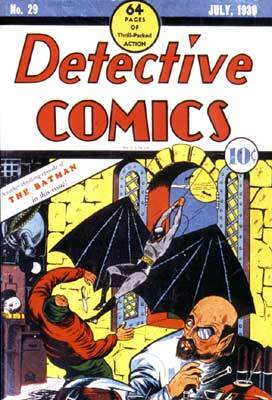 Bob Kane's early Batman design is still eye-catching. 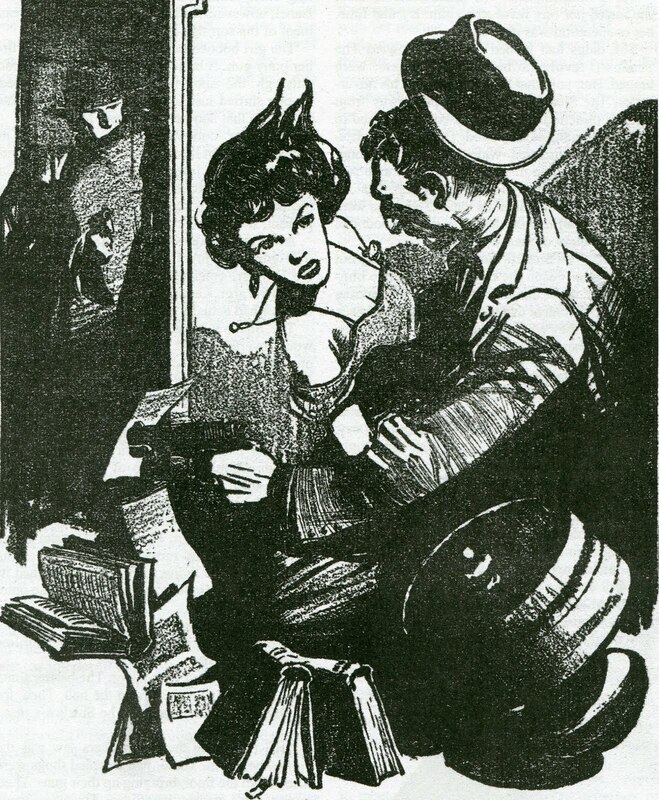 The Fat Man was supposedly based on Dashiell Hammett’s “Continental Op” character, but he’s really not. The Op (so-called because he’s never named in the stories he narrates) is an agent for the Continental Detective Agency—a skilled P.I. who happens to be a little overweight. The protagonist of the radio show, though, has a name (Brad Runyon) and works as an independent investigator. And he’s really, really fat. It was a case where Hammett just let him use his name in the credits, then took the money and ran. That’s okay, though, since the show was a pretty good one. Character actor J. Scott Smart endowed Runyon with intelligence and rolled words out of his mouth in a manner that somehow sounded fat. And the individual episodes were well-written. In “Order for Murder,” Runyon is taking a trip when his car breaks down. He’s picked up by a man with horrible facial scarring who blames his former army commander for his woes. Fearing the man is planning murder, Runyon decides to warn the commander. On the way there, though, he has encounters with the commander’s bitter ex-wife--who is convinced that ghosts rising up from the family graveyard will take vengeance upon her former husband. Then he meets the current wife, who is quickly revealed to be having an affair and admits to getting married just for the money. Actually, this aspect of the plot stretches coincidence a little too far. Getting a ride from someone who turns out to be a potential murderer is fine—that sort of thing is an accepted convention of the genre. But Runyon runs into three suspects in quick succession without even trying. Still, the rest of the story is done well enough to earn forgiveness for this one brief Sin of Poor Plot Construction. There’s an attempted murder followed by a successful murder followed by Runyon having to figure out which of the three suspects is guilty. His deductive reasoning here is perfectly sound and the episode comes to a satisfying conclusion. The Fat Man wasn’t the finest of the many hard-boiled P.I. shows that came to radio in the years after World War II, but it was still a good one. Well, the Shadow had finished off a blackmail ring in New York City, taking out one finger of the loosely-knit criminal organization known as the Hand. Ring Brescott has set himself up in Philadelphia with what’s actually a pretty clever racket. He hires his gang out to commit murders. His customers pay off by purchasing fake paintings and cheap antiques at huge prices. That way, you could hire Ring to off your rich grandfather, but all the cops could pin on you was that you were dumb enough to buy a fake Fragonard. But Ring didn’t count on the Shadow, though it’s actually the Shadow’s top agent, Harry Vincent, who first arrives in Philly. Harry does some investigating, but this gets him kidnapped by some of Ring’s thugs. A spunky girl who is herself looking into the gang’s latest murder almost gets whacked in the process, but the Shadow shows up in time to save her. The Shadow takes up the investigation, dodging bullets when necessary (and, in one case, dodging the descending hammer of a dishonest auctioneer). He has a bad night at one point when a car chase leaves him with a wrecked vehicle and a slight concussion—but he’s THE SHADOW, gosh darn it, and this hardly slows him up at all. In the end, he outfights and outthinks the bad guy, pulling off a con that allows him to rescue Harry, take out the bad guys and save that spunky girl once more for good measure. 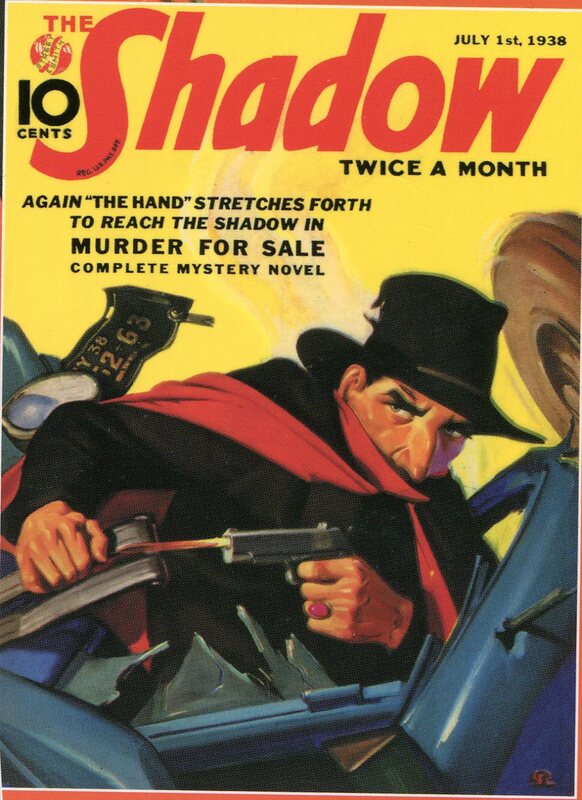 Most of Walter Gibson’s mind-numbingly fun Shadow novels average a 9.4 on the Bogart/Karloff Coolness scale. “Murder for Sale” actually only gets an 8.9, since twice depends on a very unlikely coincidence to allow the Shadow to keep on the trail of the villains. Gibson, well able to construct sound plots, usually does much better than that. But despite its flaws, it’s still a fun read--an exuberant action/mystery with great action set pieces and a spunky girl. Spunky girls alone bring any work of pulp fiction up at least two-tenths of a point on the Bogart/Karloff scale. So with the Hand diminished by 40%, the Shadow will soon be moving on to Chicago to see if he can clip off another finger. We’re going to do something a little bit different this week. We’ll still take a look at an old comic book, but this time we’ll be judging it not just on its own merits, but also in comparison to the prose story on which it was based. 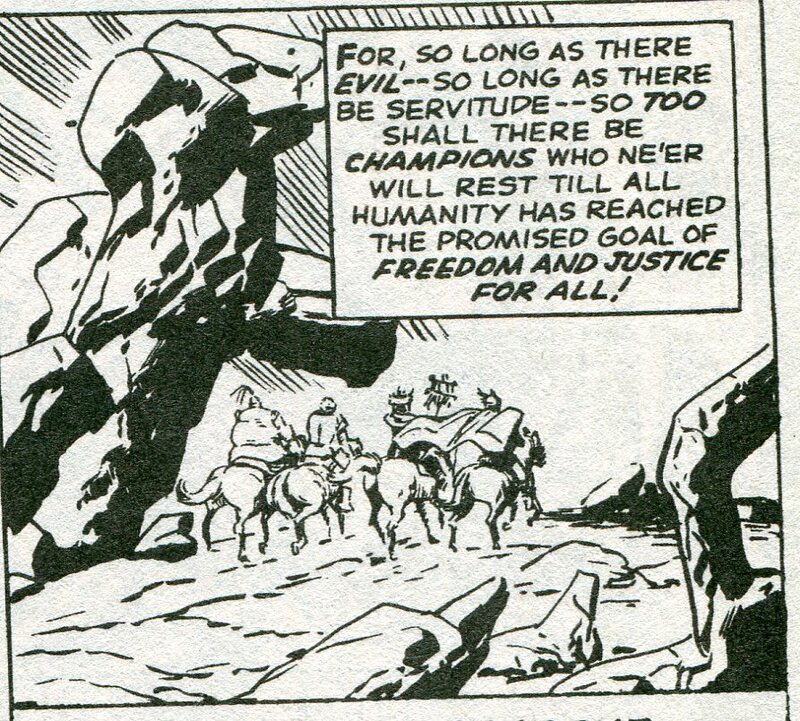 The comic was published in 1977, but to get the full story, we have to jump back to 1941. 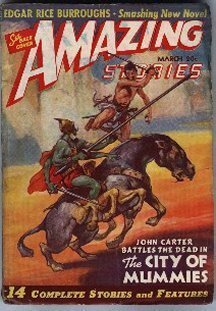 This was when Edgar Rice Burroughs published “The City of Mummies,” a John Carter of Mars novella, in Amazing Stories magazine (March 1941). 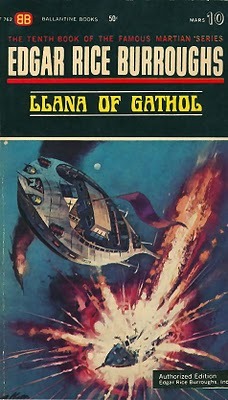 In the novella, John Carter is taking a break from his job as Warlord, flying alone over an unexplored region of Mars. 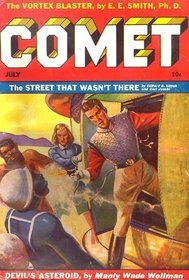 Near an apparently deserted city, he saves a human from a half-dozen green Martians, but then discovers that the man he saved is a member of an insular society that wants to keep their existence a secret. So John Carter is sentenced to death. Some fast talking by the guy Carter saved (Pan Dan Chee) gets them locked up in the lower pits of the city for the night. Carter and Pan fight some of the giant Martian rats known as ulsios, nearly get murdered by an immortal madman and encounter ancestors of Pan Dan Chee’s people who had been kept in suspended animation for a half-million years. Then, in the most shameless coincidence Burroughs ever used (and he’s a writer who did not shy away from using coincidence), they discover that Carter’s granddaughter Llana is also in the pits, having ended up there after having escaped kidnappers. Pan Dan Chee falls in love with Llana and the trio escape from the city. Like almost all of Burroughs’ stories, this one is a fast-moving and entertaining adventure story, with a few bizarre twists and turns thrown in. There’s a lot more humor in it than in most of Burroughs’ adventure fiction. Some have suggested (I think accurately) that Burroughs was practicing a little self-parody in his later Mars stories. That’s fine, because he blended the humor smoothly with good storytelling. By the way, the novella was renamed “The Ancient Dead” when it and its three sequels were collected into a single book. 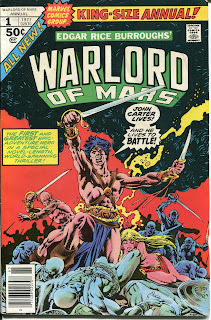 In 1977, writer Marv Wolfman adapted this story for John Carter: Warlord of Mars Annual #1. But where “The Ancient Dead” was originally the beginning of a novel-length story arc, now it was going to be a single 34-page comic story. So poor Llana disappears from the story. Instead, Pan Dan Chee falls in love with a reanimated queen from his city’s past. Other changes are interesting to note. There’s a cool action bit in the original story when Carter chases down and finishes off the last green Martian in the fight where he saves Pan. This is truncated in the comic, probably because of space issues. But there’s action added later on. In the original, a single ulsio attacks them when they enter the pits. Pan kills it while a then-unarmed Carter pretty much just watches. In the comic, there’re three of the hideous things attacking and Carter plays a much more active role in the fight. Later, they meet the madman who has been trapping people in suspended animation for millennia. In the book, when Carter bests the old guy, he simply executes him. I assume the Comic Code Authority wouldn’t allow that, though. 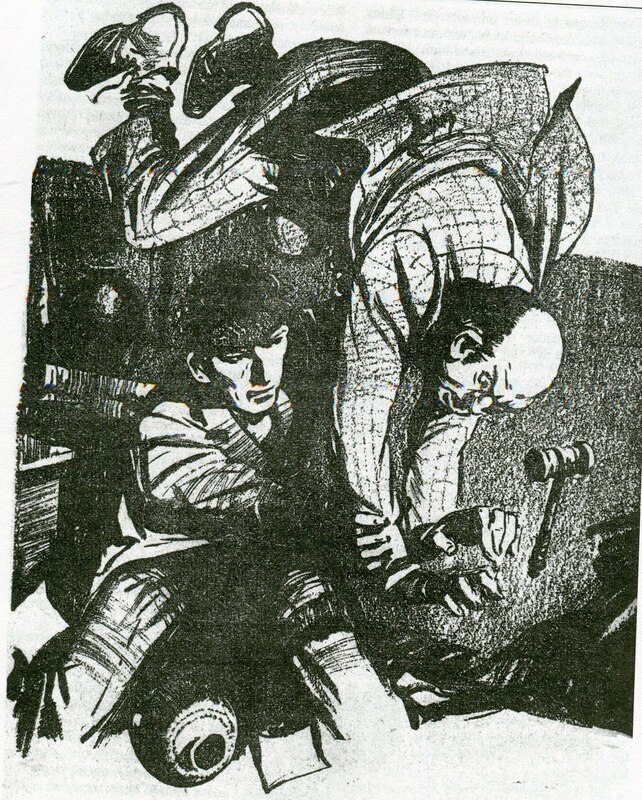 In the comic, Carter simply knocks the guy out. In both cases, taking out the madman causes those who had been in suspended animation to wake up. Without having to worry about working Llana into the story, Wolfman adds some more action here. In the original, the ancients saw how much the planet had changed, then collapsed in heaps of dust as their age catches up to them. The “action” in this section of the story came from Llana;s account of her kidnapping and escape. 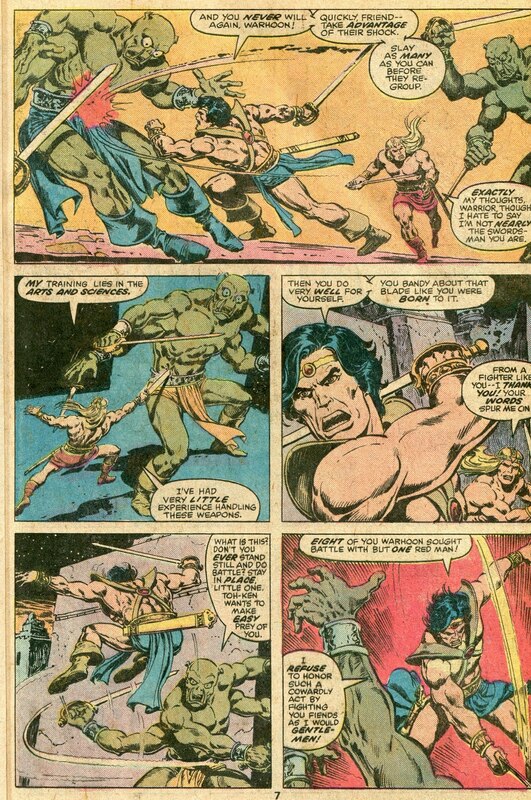 In the comic, with no Llana to tell stories, Wolfman has the ancients get really upset with the situation and attack John Carter. Pan Dan Chee is no help, as he’s busy wooing the queen he’s fallen for. So Carter has to fight alone while the landscape keeps inexplicably shifting back-and-forth from present day to what it was 500,000 years ago. Sal Buscema’s art makes it all look great and this version of the story is also entertaining. I do have a small complaint about the climax, as Wolfman never really properly explains the whole landscape-shifting thing. But what the hey. It’s Mars. Weird stuff happens there. John Carter of Mars is a great character and Marvel’s late ‘70s comic book run was faithful to the spirit of the original stories and had some great artwork by artists such as Buscema, Gil Kane and Dave Cockrum. This Annual is a solid example of the series’ quality. John Carter was a functional immortal, so he’s still up there on the Red Planet wielding his sword against villains and monsters. If he’s had a chance to visit Earth in recent decades and read the Marvel comics, I think he’d approve. Giant robots score a 8.3 on the Bogart/Karloff Coolness Scale. Damon Runyon’s wonderful short stories were a perfect match for radio—his fun, highly readable prose translated to the airwaves without any loss of humor or emotional impact. Most of Runyon’s stories were comedies about gamblers and low-level criminals who hung around Prohibition-era New York City, but there were a few tragedies tossed into the mix. “Baseball Hattie” is one of those tragedies, a very human drama about a woman who marries an up-and-coming New York Giants pitcher. At first, it seems like the two are hopelessly in love and destined to live happily ever after. 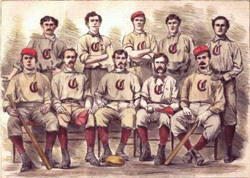 But when the pitcher becomes involved with gamblers, things go downhill fast. It’s a soap opera-y story, but it’s an effective one, with both the dialogue and the acting bringing a real humanity to the proceedings. That it manages to pull an uplifting ending out of its inherent tragedy serves to make it that much better. 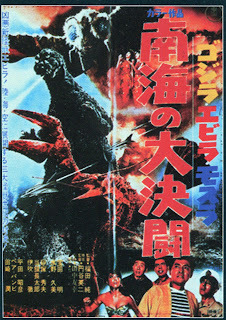 The original Godzilla (especially the non-dubbed, Japanese version) was a parable condemning nuclear weapons, but it didn’t take the many sequels long to eschew any thematic point to the movies. The inherent coolness of watching imaginatively designed monsters destroy cities and battle one another soon overwhelmed any desire to shove a moral into the series. The Godzilla series as a whole scores a 9.1 on the Bogart/Karloff Coolness scale, while the 1966 entry, Godzilla vs the Sea Monster (aka Ebirah, Horror of the Deep), scores an 9.0. It’s a fun movie, made when Godzilla had pretty much finishing morphing from horrible menace to occasional savior of humanity. The previous film, for instance, had Godzilla and Rodan double-teaming Ghidorah to save the planet from alien invasions. This time out, the villains are humans—a secret organization called Red Bamboo that’s set up a lab/slave labor camp on a Pacific island to produce nuclear weapons. While hiding out from the Red Bamboo, the heroes stumble across a cave in which they find a sleeping Godzilla. Soon, they get separated and the movie does a fine job of balancing several convergent plot threads. Secret bases are being infiltrated, escapes are being planned, traps are being set, and one character ends up taking an unplanned but fortuitous balloon ride. One of those threads involves several of the heroes using a make-shift lightning rod to wake up Godzilla, who soon gets into a battle with Ebirah, a giant lobster. And it is a… well, let’s say unique battle. Godzilla tosses a giant boulder at Ebirah. Ebirah bats it back at Godzilla with his claw. Godzilla head-butts the boulder back Ebirah. 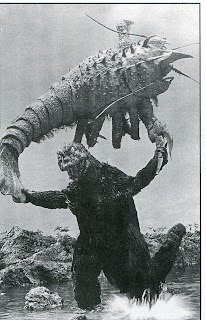 The lobster catches it in his claws and—I’m not making this up—does a little wind-up before throwing it back at Godzilla. The scene is emblematic of the entire film. It’s silly—but it still plays everything seriously and the end result is an entertaining fantasy film. Everything that happens is actually inherently logical within the context of Godzilla’s expanding mythology. We even get a Mothra cameo at the story’s climax. 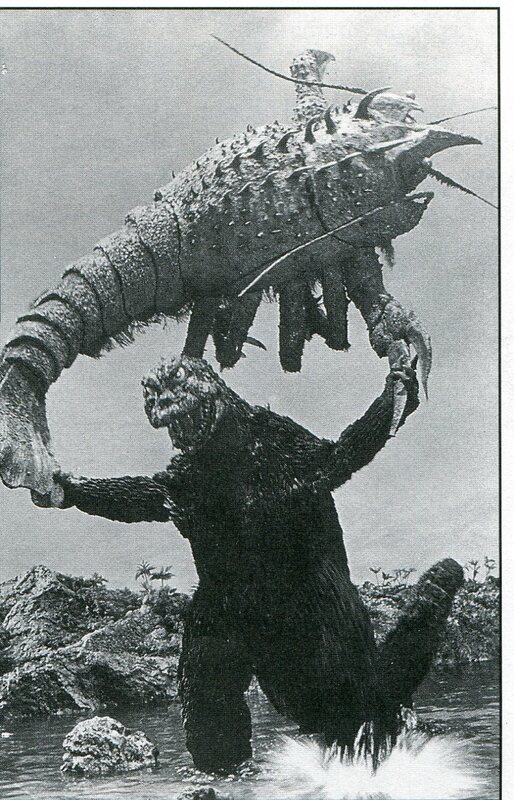 So Godzilla playing catch with a giant lobster may be absurd, but we have no problem accepting it a face value while watching this movie. 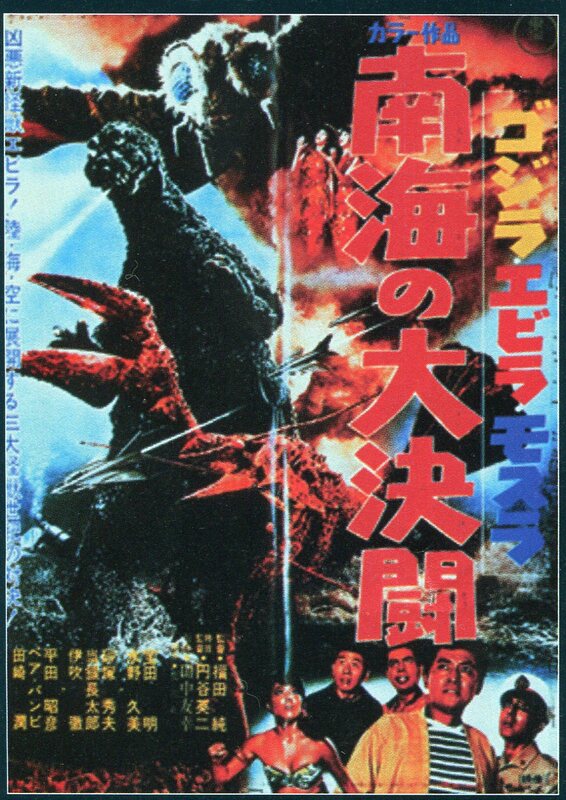 The invaluable Official Godzilla Compendium tells us that this film was originally meant to feature King Kong rather than Godzilla. 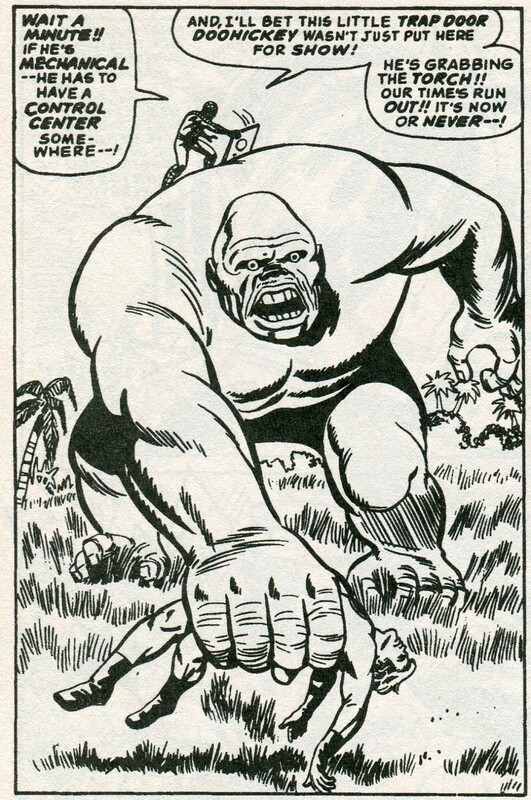 A version of the giant ape had already appeared in the classic King Kong vs. Godzilla in 1962 and he’d pop up again in the not-quite-in continuity film King Kong Escapes in 1967. Though, to be fair, Kumi Mizuno (the actress playing the escaped slave girl) is nice enough on the eyes to interest any male, regardless of species. The main plot here involves Alicia Masters, who has been teleported to a scientific enclave in some remote part of the world. The scientists there are all men who have faked their deaths to join a project to save mankind from war, sickness, etc by genetically engineering a more perfect race of humans. Now they need a blind sculptress. You see, their prototype perfect human has broken out of its birthing chamber and is now generating a “blinding power,” so they can’t even see what it looks like, much less communicate with it. They need Alicia to enter the room the creature is in and—unhampered by the blinding light—sculpt an image of it. 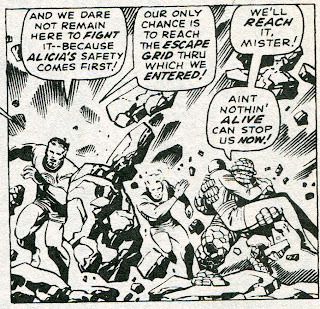 This is actually one of the few weak storylines that came up during the Kirby/Lee era. First, the scientists are all presented as benevolent. But their plan seems to be to replace all us tragically flawed humans with a superior version? Or would the genetic supermen simply rule over us? Someone call Captain Kirk—Khan is in the house!!!! Also, the plot is painfully contrived to come up with a reason to bring Alicia into the plot. “Men, the only possible solution to this situation is to find a blind sculptress somewhere!” Gee whiz. But despite this, the issue is still an enjoyable one, mostly because of the character moments that take place within the main plot. For instance, Ben is feeling sorry for himself and takes a walk in the park, where he runs into a group of kids who think he’s the greatest guy in the world. 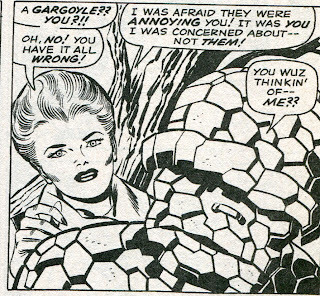 It’s a really nice touch, continuing to single out Ben as the emotional center of the Fantastic Four. Anyway, it all ends with Reed about to figure out a way to duplicate the teleportation device that took Alicia away, while Alicia is about to confront the mysterious creature. While the Fantastic Four is experiencing one of its few weak story arcs, Spider Man is finishing up one of his best. 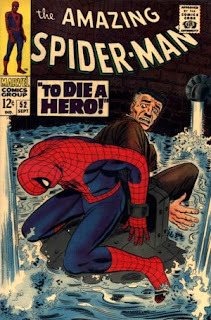 Spidey and Jonah are chained together in a basement room that is rapidly filling with water, but the webslinger manages to use a combination of his strength and his brains to come up with a clever method of surviving, then getting a jump on the Kingpin’s thugs. 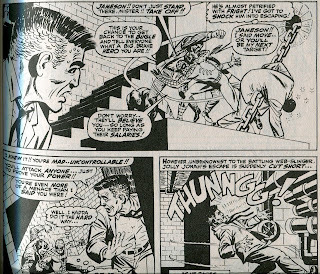 The sequence of action scenes that follow—Spidey vs. thugs near the deathtrap; Spidey vs. thugs on a stairway; and Spidey vs Kingpin in a rematch—demonstrate that John Romita Sr. was in the same expert class as Kirby and Ditko in choreographing fights that are exciting AND flow along in a logical manner. Not surprisingly, the interaction between Spidey and JJJ is a lot of fun, with a surprising amount of sympathy generated for the pure terror that Jonah is understandably feeling. In the end, the Kingpin escapes, but he’s now known to the police. 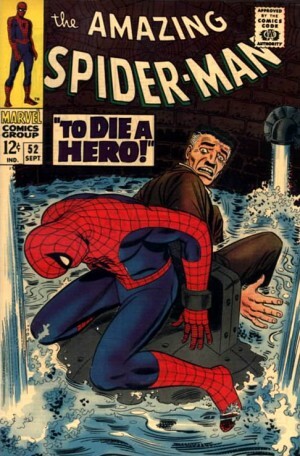 And, in a great character moment, Frederick Foswell sacrifices his life to save Jonah Jameson (“You’re the only one who ever helped me… or gave me a second chance.”) What’s cool about the whole thing is we’re never sure if Foswell was really turning crook again or if he was working undercover. But whatever his original motivation, he redeems himself in the end. Also, Flash Thompson is home on leave from the Army AND we learn the city editor we briefly met last issue is named Robertson. This more proper introduction of him is handled with skill. Though we only see him for two panels, his take charge attitude in dealing with Jonah’s disappearance does a lot to establish his character. Thor amps itself back up to cosmically awesome levels for this issue. While the Thunder God takes on two of the Enchanters on Earth, gradually gaining ground against them despite their apparent omnipotence, the third Enchanter challenges Odin himself to a duel. The conditions of the duel include Odin cancelling the powers of all Asgardians, while the Enchanter cancels the powers of his two allies. This part of this otherwise fun tale is a little contrived. The reason is apparently to make sure the duel is a completely equal one, which is fair enough. But even though Odin doesn’t know Thor is in a fight to the death down on Earth, the Enchanter is certainly aware what his two brothers were up to. That was part of their plan, for gosh sakes. So he arbitrarily cancels out their powers? Gee whiz, this guy may be omnipotent, but he’s not that bright. Anyway, Thor, with some help from Balder and Sif, curb stomp the Enchanters. 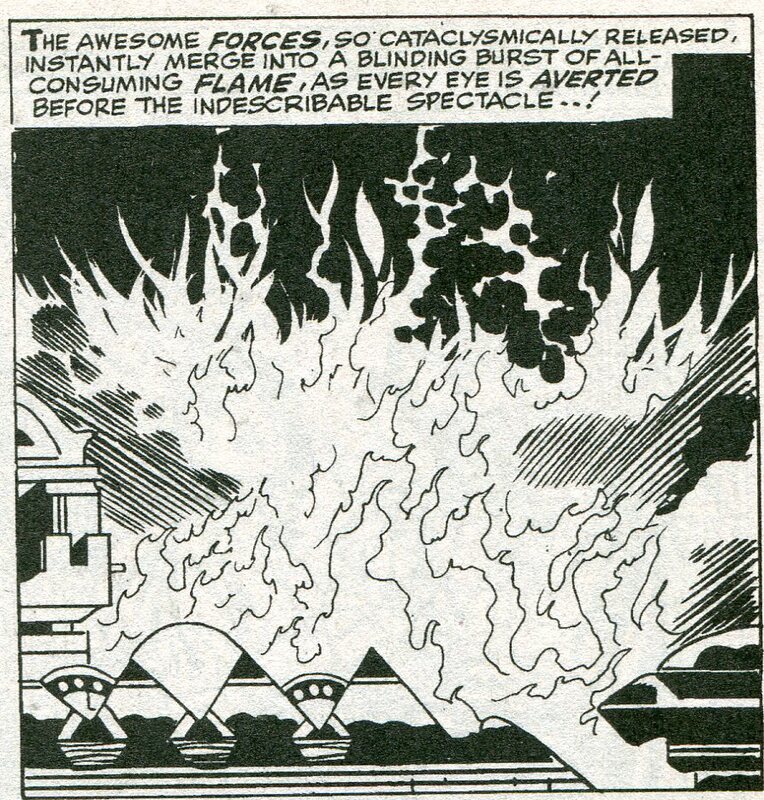 What we see of the duel is probably the coolest part of the issue, with the two all-powerful beings flying through space like a comet that “shatters planets as if they are ant hills…the heat of its passing leaves new burning suns in its galaxy-wide wake.” Now THAT’S cosmic!!! 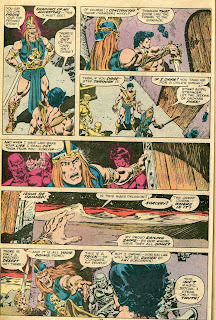 The next-to-last “Tales of Asgard” shows us Thor, Fandral, Hogun and a rebel named Alibar the Vagabond in a desperate last stand against the horsemen of Satan. But, just as all seems lost, Volstagg shows up with that big magical ray gun he acquired last issue. Needless to say, Volstagg earns himself a Crowning Moment of Awesome. That it for September 1967. 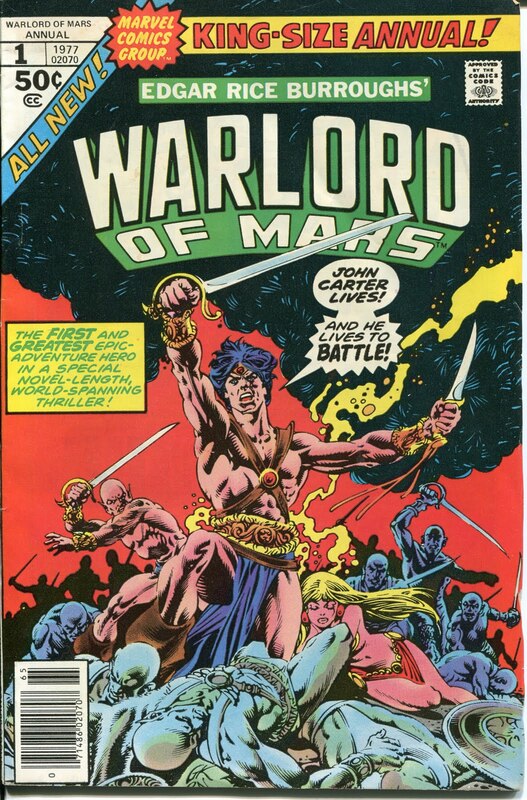 Next week, we’ll pause again in our chronological march through the Marvel Universe to visit Mars as we take a look at a comic book adaptation of one of Edgar Rice Burroughs’ classic stories. In two weeks, we’ll return to the Marvel Universe as the FF continue to look for Alicia; Spider Man fights an old enemy; and Thor… joins the circus?